Elmsford, NY, June 3, 2010 /PN - Mamiya/ Mamiya announces today the new Mamiya RZ33 large-sensor digital camera kit for professional photographers. The Mamiya RZ33, featuring a high performance 33 megapixel CCD sensor, advances the long adored Mamiya RZ line to a new level, bringing the famous ease-of-use and versatility of the Mamiya RZ camera system to the large-sensor digital arena. With no cables necessary, RZ33 users simply add their favorite razor sharp RZ lens and a CF card, and they are ready to produce big, detailed, gorgeous images. With the demand from photographers to provide their clients with clearly superior digital image quality, Mamiya’s new RZ33 digital camera kit is the result of an evolution into the next generation of digital large-sensor cameras. It offers advanced microprocessor technology for direct communication of all camera functions to its 33mp digital back through its MSC (Mamiya Serial Communication) system. The result is cable-free digital operation just as smooth and trouble-free as shooting with film. 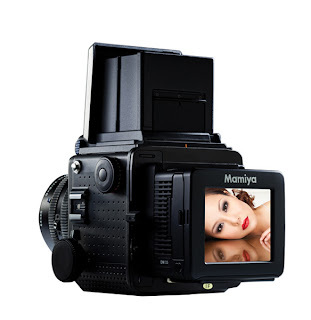 The new Mamiya RZ33 is ideal for existing Mamiya RZ system owners that already know and love the system as well as those professionals looking to add the quality of medium format photography to their workflow. It features cable-free integrated-operation, a large 33 megapixel CCD sensor, is fully compatible with all Mamiya RZ system lenses, viewfinders and most accessories. Of course, the RZ’s legendary Vertical-Horizontal rotation is built-in so there is no need to ever turn the camera. Precise Rack and pinion bellows focusing, with left and right course and fine focusing adjustment knobs plus a locking focus lever. The bellows focusing system provides for close-up focusing capabilities with every RZ lens, as well as infinity focusing—all without mounting-and-unmounting cumbersome adapters. Interchangeable Mamiya world-class quality lenses, with built-in leaf-shutters offer shutter speeds from 8 to 1/400sec. (plus T-setting for up 32 seconds). Electronic flash synchronization is achieved at all shutter speeds and intermediate shutter speeds can be set on the camera’s speed dial setting for more critical digital exposure control. Interchangeable Viewfinders, offer multiple viewing options. Choose from the waist-level finder (included) for low-angle versatility, or one of the eye-level prisms, such as the AE Prism Finder FE701 which provides A/S Matrix metering, 1/6 f/stops exposure accuracy plus an LED function display in the viewfinder. Interchangeable power winder (optional). The Power Winder 2 is powered by AA batteries or an AC Adapter and adds ease of use by cocking the shutter and resetting the mirror automatically. It produces single or sequential exposures at about 1 frame per second. It can also be remote controlled with radio or infrared transmitters. Many fail-safe system checks, warn the photographer both with visual and audible warning alert signals. And, the new RZ33 is system compatible with all existing RZ lenses and most accessories. I want to get this.